It’s only fitting that we start our mixed all-club team with one of the most dominant players we’ve seen in the division. Sarah Meckstroth is still the do-everything heart of Minneapolis Drag’n Thrust, and it was her efforts which powered them to the second seed at Nationals. 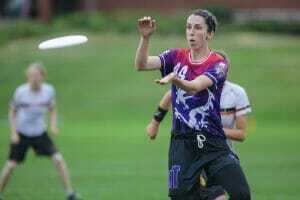 Despite playing limited points in San Diego, she still led Drag’n Thrust in scoring at Nationals, showing just how much the team relies on her, and how imposing a presence she can be on the field. Drag’n Thrust returned to title contender status this year, and Meckstroth is why. She could join any team in the division and make them instant contenders, or make a contender a title favorite. You’d be hard-pressed to find a more complete player than Peter Prial. After years as a dominant downfield cutter for Ironside and Truck Stop, Prial jumped back to the mixed division with Boston Snake Country and was the engine that powered their run to the semifinals. 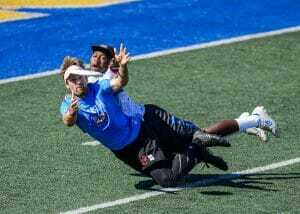 He led Snake Country in scoring in San Diego, crossing over to the D-line to pick up important breaks to keep Boston pushing through the bracket. He was impressively efficient, with only three turnovers despite playing every offensive point. Beyond that, he was an emotional leader for a new team, injecting energy and big game experience. Prial manufactured points on his own against some of the best defenses in the division, and pushed his team to new heights as a result. Last year’s runner-up for POTY in the Men’s Division made a huge splash during his debut season in the elite mixed scene. Whether he was bodying out defenders for goals, launching full field hucks, or earning point blocks with his fearsome mark, Nicky Spiva made a plethora of contributions to Philadelphia AMP’s first championship season in program history. In August, he recorded an astonishing five second-half assists in AMP’s U.S. Open final win over BFG. At Nationals, Spiva led the team in both assists and blocks, including one of both at perhaps the most critical moment of the tournament, on double game point of the semifinals. 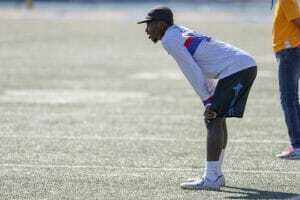 Spiva’s rare combination of size, speed, and skill presented a matchup problem for every opponent, and the experience he gained with the 2017 World Games Team no doubt helped prime him to quarterback the offense in his first year on the team. Some people make ultimate look effortlessly easy. 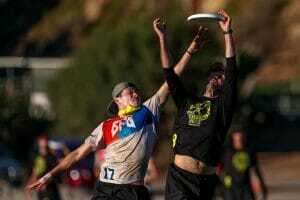 With his length, blazing speed, disc skills, and seemingly endless motor, Mac Taylor is one of those players. From the very start of the season, Blackbird placed Taylor at the center of their strategy, running their offense through him and asking him to cross over to defense whenever they needed a break. Always a threat to turn on the jets and take off deep, he set up huge initiating cuts in isolation out of a sidestack and then turned to fire away to a slew of athletic receivers. A natural thrower, Taylor has some of the smoothest releases — not to mention fakes — in the division. That all-around skilllset made him once again one of the most dominant players in club, even as he aged into Masters eligibility this season. The wildest part about Georgia Bosscher making the All-Club 1st Team is that this is her first time earning any Ultiworld award recognition. As one of the top players of her generation and a World Games team captain, her multifaceted skillset and overall excellence has been on display for longer than our site has existed, so consistent that no season ever rose above the rest. Yet in 2018, she was stood out on a roster filled with other generational talents like Jenny Fey, Sandy Jorgensen, and Claire Desmond. As an initiating cutter, downfield threat, and impromptu handler, Bosscher sliced and diced her competition all year. Her usage rate may not be as high as it was on Heist, but it allowed her the freedom to outplay her defenders and take control when Space Heater needed it most. When BFG lost two of their top players in a mid-season roster shakeup, it could have spelled doom for the Seattle side who needed to replace a ton of offensive production and firepower. For no one did the load increase more than Lindsay Simon Fox. 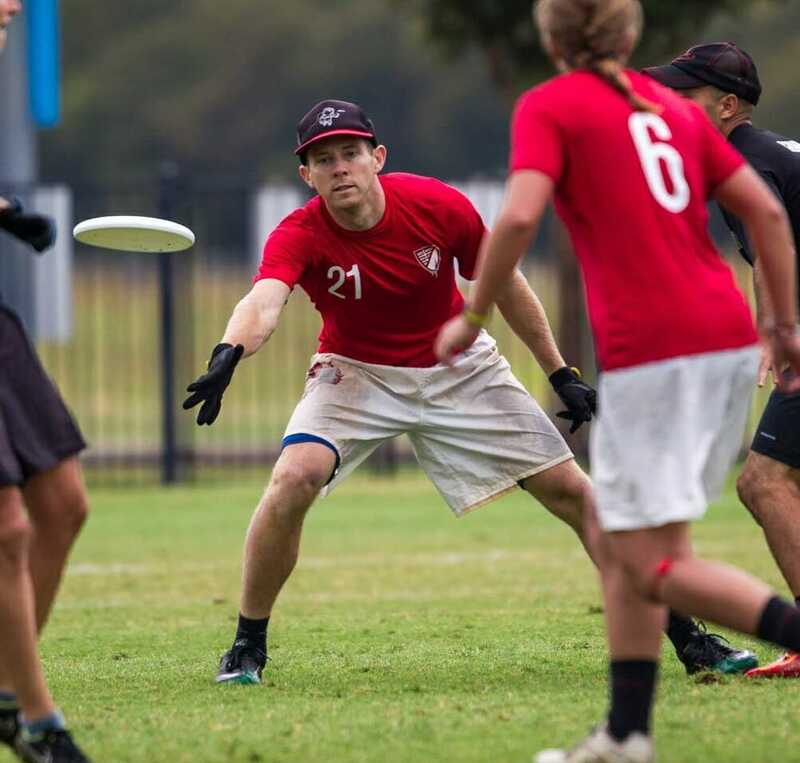 Already a key cog in a WUCC-title winning offense, it was Simon Fox asked to step up into a starring role to smooth the transition and then take over. Frequently operating as the initiating cutter for the O-line, Simon Fox ate up huge chunks of yardage with well designed cuts. She powered past defenders with her long stride to score goals off hucks while also being just as content to grind through unders that steadily advanced the Seattle offense. She was the team’s leading goal scorer in San Diego, tied for second overall in the mixed division at the tournament. Even as BFG proved that their depth was their strength, Simon Fox stood out. The best defensive player in the division and an elite offensive talent, Khalif El-Salaam led Seattle Mixtape this season back to final and until he could hardly walk. As perhaps the best aerial threat in mixed, El-Salaam locked down the deep space for Mixtape, often alternating between matching up tight and smart help defense while on offense, he broke open games in an instant with full-field throws and downfield dominance. At Nationals, El-Salaam made play after play as Mixtape fought their way to the final from a difficult prequarters matchup with San Francisco Polar Bears, although El-Salaam was unable to go during their semifinal game due to an Achilles injury. Despite being hobbled during the final, El-Salaam still showed his defensive prowess against fellow All-Club members Nicky Spiva and Sean Mott, displaying his merits as the best defender in Mixed and one of its best all-around players. 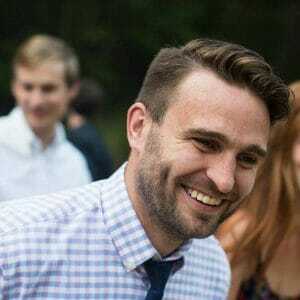 Comments on "Ultiworld’s All-Club 2018: 1st Team (Mixed), Presented By Greenbackr"